Disaffected commercials director Toby Grisoni (Adam Driver) walks off the location shoot of his latest commercial when he realises he is close to the Spanish hilltop village where he shot his first ever film The Man Who Killed Don Quixote. 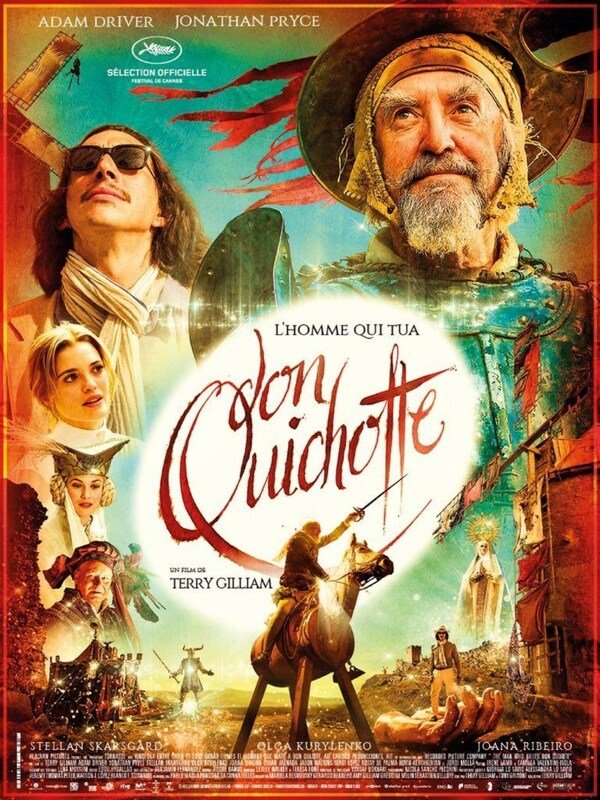 Hoping to reconnect with his non-actor cast, he finds the beautiful Angelica (Joana Ribeiro) is missing and his former leader actor Javier (Jonathan Pryce) has slipped into a crippling delusion that he is actually Don Quixote. Furthermore, Javier mistakes Toby for Quixote’s fictional squire Sancho Panza. The Man Who Killed Don Quixote is one of the more notorious film productions of recent decades. An original attempt by writer/director Terry Gilliam to shoot the film in 2000 – and starring Johnny Depp and Jean de Rochefort in the lead roles – ended in catastrophic failure, and the project was subsequently held up by legal challenges and contract disputes for almost another two decades. Finally shot and released by Gilliam in 2018, it feels almost anti-climactic: finally up on the big screen, and his fabled failed masterpiece turns out to simply be a movie. In all honesty it was always going to disappoint its most eager viewers. I think it is important to note that this Man Who Killed Don Quixote has a different screenplay to the aborted 2000 version. That featured an advertising executive thrown back in time to meet an actual Quixote. This revised version never leaves the present day, but instead has a cynical film director forced to confront his actions filming a Don Quixote movie a decade earlier. It is hard not to see the autobiographical element of such a change: this is not a remount of a failed film but very much its own production. The failure of one film has brought the other into existence. It is a shift that honestly gives Gilliam’s new version a far more intriguing premise than his old one. It’s a classic sort of Gilliam feature as well. Visually it keeps the fishbowl-esque wide angles that he overwhelmingly favours, which give everything a warped and claustrophobic aesthetic. It retains a strong sense of the absurd, and constant little touches of magical realism. It also feels deeply patriarchal. Women are represented as victims and damsels, or as objects to a worrying extent. This is nothing new for Gilliam – he regularly sidelines his female characters – but it is a creative tic that is ageing badly. One could forgive it as a known factor in a veteran director’s oeuvre, but that honestly only takes one so far. Sooner or later Gilliam’s fan are going to need to recognise the elephant in the room; furthermore Gilliam himself is really obliged to do so, otherwise he is ultimately going to be relegated to history and stop being considered an active, contemporary voice in cinema. The film is anchored to Adam Driver’s strong, cynical performance as Toby. He is a great combination of being both charming and flawed. He has made and continues to make mistakes. He is regularly dismissive of others, and rather self-centered. It is a difficult set of attributes to appeal to an audience, but Driver’s performance does much of the heavy lifting. Jonathan Pryce is in fine form as Don Quixote, both funny and somewhat pathetic. It is a character that can get infuriating to watch, but – much like Driver – Pryce manages to sell it brilliantly. The film looks and sounds great, and brings with it the bleak cynicism and tragedy that underlines much of Gilliam’s work. No film was ever going to match the hype of this project, but Gilliam comes incredibly close. It is a traditional addition to his catalogue of works, and while not matching his best films – Brazil for one, The Fisher King for another – it is an entertaining and effective fresh take on Cervantes’ notoriously impossible-to-film novel.